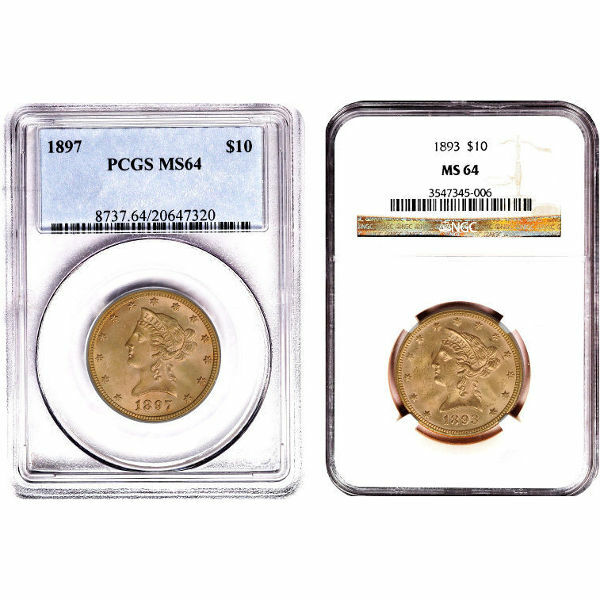 Customers: Please take note that these coins will be certified by either the PCGS OR NGC and graded as MS64 condition. We will select coins from years ranging from 1838-1907 to fulfill your order based on our current inventory selection. Released by the U.S. Mint in 1838, these coins were produced through 1907. 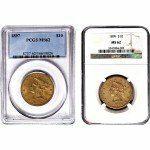 Increasingly difficult to find, these rare historic coins are highly sought after by both collectors and investors. With their gold content of .48375 troy oz of pure gold, these $10 Liberty Head Gold Eagles are in above-average condition and certainly ideal for display. Each $10 Liberty Head Gold Eagle MS64 features Lady Liberty wearing a coronet inscribed with the word ‘liberty.’ The acting engraver Christian Gobrecht designed Lady Liberty in the Greco-Roman style surrounded by thirteen stars to represent the thirteen original colonies. The coins have been minted with detailed artistry. The reverse of each coin showcases a naturalistic eagle representing American liberty. The bald eagle holds arrows and an olive branch, symbols often present on American coinage. The inscriptions on the coins include “In God We Trust,” “The United States of America,” and the face value of $10. Silver.com ships these coins securely within 3 days of cleared payment. All mailings are insured against loss or damage for our customers’ protection. The U.S. Mint is known for its high-quality production of precious metal coinage and these historic pieces are certainly no exception. You can invest in these historic coins and build your portfolio of investment gold. If you have questions about these MS64 $10 Liberty Head Gold Eagles or any of our other items, please call us at 888-989-7223. Feel free to reach us through live chat or email as well. If you are looking to grow your investments in precious metals, be sure to view our full offering of the $10 Indian Head Gold Eagle coins.